Among many powerful tools in Photoshop is the king of kings: the pen tool. This tool is shrouded by personal anecdotes of confusion and frustration. Although creating paths with the pen tool is difficult at first, the process becomes easier with practice and is well worth the effort. Every path is vector-based which means you can scale it larger or smaller without any quality loss. But paths can be very frustrating if you don’t know how to use them. I’d like to cover the process of converting a path into a shape layer. 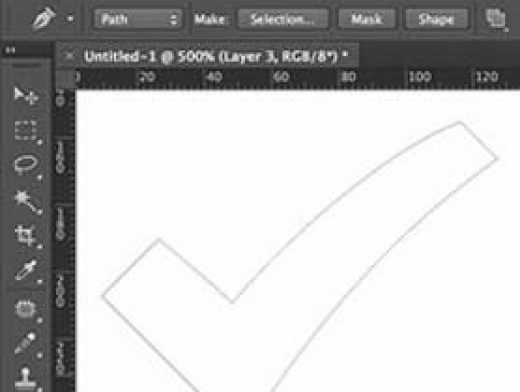 In case you didn’t already know, shape layers are merely paths that can hold fills & outlines. This also means you can apply layer effects and even filters if you convert the same into a smart object. Note that a path is merely a series of points like an outline which can become a selection. It’s the raw material of shapes but not quite a shape in-itself.